The Papua New Guinea Opposition has rejected claims of inciting security forces to destroy Parliament while slamming APEC bosses for fleeing the country without fixing the mess. 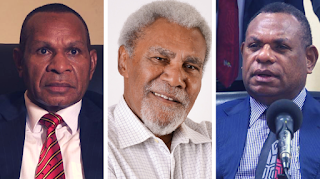 Opposition Leader Patrick Pruaitch, East Sepik Governor Allan Bird and Vanimo Green MP Belden Namah took a swipe at APEC Minister Justin Tkatchenko and APEC CEO Chris Hawkins in a media conference yesterday. “We are also told that Minister for APEC has left the country, we are also told that the CEO of APEC has fled the country, for goodness sake! stay and fix your mess, stay and face our people and fix your mess and yet Chris Hawkins has seen fit to blame the opposition of inciting violence when security personnel moved into Parliament. Governor Bird said when security forces invaded Parliament, the opposition were inside the House working on the budget reply. “We were blamed for it, we were inside Parliament working with our Shadow Treasurer on his response, we had no part of it, anytime something happens, they blame us, when good things happen, they say we did it and something bad happens they say Opposition did it. Mr Namah said he is disappointed that APEC Minister and CEO disappeared from the country when the security forces raised serious issues about their allowances for not being paid. “That is the responsibility of the APEC Minister and CEO to ensure that the security forces and every other personnel involved in the APEC were properly paid their dues, for Chris Hawkins to try to point fingers at the opposition, I want to remind Chris Hawkins that you are not a Papua New Guinean, you are a foreigner. “I also want to remind Justin Tkatchenko that your are also a foreigner in this country, you both have no right to point fingers because you do not know how people behave.